SPECTACULARLY UPGRADED & STAGED! Find the luxury and enjoyment youGÇÖve been looking for: Williamsburg-grade millwork, stainless steel Viking kitchen, 1050 sf luxury master suite, huge home theater, game room, family room, regal office, workshop, 3.5 acres with wrap-around lagoon and much, much more. HomeownerGÇÖs vision was for high-quality legacy estate of casual elegance, privacy and fun. Neo-classical architecture reminiscent of a bygone era of Southern sophistication. Property approved for pool, stable and horses. Riding trails abound. DonGÇÖt miss seeing this GÇ£newGÇ¥ home for a visual treat. YouGÇÖll be glad you did!! See 3D VT Link. Estate living at its best! The most bang for the buck in the area. Home boasts over 5400 sqft. Spacious open floor plan offers a blank canvas. Located on 6.1 wooded acres in Prestigious Rose Hill Plantation, the 3rd largest lot in Rose Hill. Featuring 4BRs, 3 full & 3 half baths, Huge master BR & bath on main floor, spacious kitchen, den w/gas fireplace, intercom system, wet bar w/ice maker, 3-car garage & many unique features such as the Garden area & great outdoor space. Plus, this home has a 2,156 sqft. building that is heated, air conditioned and has its own bathroom w/shower. Let your imagination go wild. Great opportunity to own two homes on 2.1 acres in Rose Hill Plantation. Main House offers 4 bed/ 3 bath with office/flex space. Large open kitchen, smooth ceilings, updated fixtures, new interior & exterior paint and a newly expanded master closet. Carriage house offers 2 bed/2 baths with 1 car garage. New horse fence GÇô 2018, New roof on both homes GÇô2019. Community amenities include an Equestrian Center with 50 acres of pasture and greenbelt riding trails, 24/7 security, 18-hole golf course, 3 swimming pools, tennis, pickleball courts & deep water access to the Colleton River. Conveniently located by HHI, Historic Beaufort & Savannah. 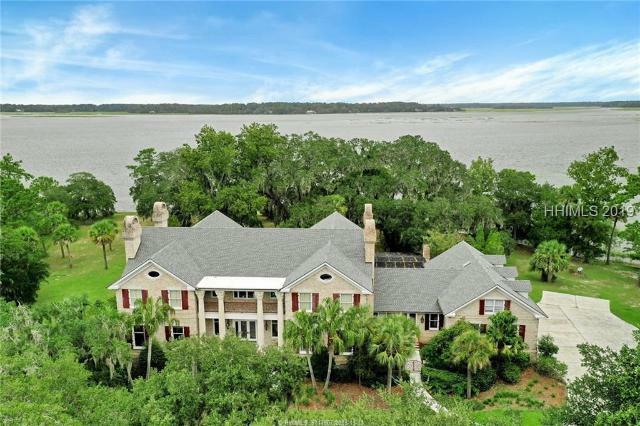 Imagine taking in the beauty of nature from your home or relaxing marsh side in your salt water pool....On just over half an acre & nestled in the back corner of the Estate side of Rose Hill, the Lowcountry lifestyle is waiting for you. When it comes time to finally move indoors, you can choose the dedicated home theater room or use the 400 sq foot workshop in the garage. Wake up in the master overlooking the marsh and unwind in the renovated master bath. 3 bedrooms and 2 full baths upstairs provide excellent bedroom separation and room for guests. Endless storage and and a flex room in the garage make this one of the best homes in Bluffton! Bluffton , SC Built-Ins,Ceiling Fan(s),FP - Glass Encl. Watch the sun come up over the fairway from your 20 x 12 covered back porch overlooking a golf course and lagoon in the distance with a December 2018 completion. Big Walk in attic that could upgraded after closing to another bedroom and bath if buyer wants to pay for upgrade over the garage and extended floor space. Owner is a SCREA. Ideally located overlooking the famous salt marshes, this light-filled single story residence boasts an exceptional floor plan for enjoying the Lowcountry lifestyle. Enter the home to a spacious, open living area w/ a vaulted ceiling & wood burning fireplace, formal dining room w/ bay windows, and access to the patio with marsh views. The expansive eat-in kitchen w/ center island offers plenty of storage. The Master bedroom features a sitting area, large WIC, and private access to the outdoor living space. New HVAC in 2017! Priced to sell, this lovely home is a remarkable value in a wonderful location and just waiting for some HGTV touches! Semi-custom MAHE model home features an open floor plan w/a light, airy, cottage feel. It will have 16 ft slider doors across the back wall in the living room leading to porch & back yard. The kitchen offers a gas range, stainless appliances, granite, gray cottage cabinets & a big island that opens to the living/dining areas. Choose a four BR plan or three BR and a flex room. Custom tiled master bath with free standing bathtub, 2 guest baths. LVP throughout all living areas, 2 car garage, nice laundry room. The home is UNDER CONSTRUCTION. Pictures, colors, features & sizes are for illustration purposes and may vary from the home as built. 3BR/2BA single level with unfinished bonus room. Open floor plan with engineered hardwood flooring in foyer, dining room, great room, kitchen and breakfast nook. Tile flooring in baths and laundry room. Granite countertops, wall oven and walk-in pantry in kitchen. Master bath has soaking tub with tile surround and separate tiled shower, double vanities and water closet. Large covered back porch, finished double garage. Looking for the extraordinary, custom built home? Look at this build by a custom home builder; well known for their quality. This low-maintenance home offers 3BR/2BA, open floor plan, large screened porch, 2-car garage and tons of upscale details such as granite countertops in kitchen and bath, custom tiled master and second bath shower, free-standing tub, craftsmanship kitchen, soft close cabinet doors and drawers, LVP throughout all living areas, walk up storage area...just stop by and see for yourself. Beautiful remodeled home. All walls and trim have been painted. New Water Heater, all new flooring throughout, Mohawk Carpet with Antimicrobial & Moisture Resistance Pad, Luxury Vinyl Plank Wood Flooring with Lifetime Warranty, Carrara Marble in both baths. All new Samsung Appliances including a Convection Oven with 5 burners on ceramic cook top. Upgraded Dishwasher, Microwave & Refrigerator. Both the Hall Bath & Master Bath have New walk in Carrara Marble Showers complete with Niches and Grab Bars, New Vanities and New Toilets. New seamless gutter in front & rear of home and new landscaping to front + a large fruit tree. Close to amenities. New construction in Rose Hill. Close to new golf clubhouse, community pool and playground. This could be your dream home. 4 bedroom, 3 bath home with a cozy vaulted family room open to sunroom overlooking private wooded homesite. Hardwood floors in foyer, family room, kitchen and breakfast areas. The master bedroom offers a large walk in closet, bath with double granite vanities and tile floors. The guest suite upstairs includes a large bedroom with full bath. And you will love the kitchen and white craftsman style cabinetry, granite stainless steel appliances, subway tile backsplash and a breakfast bar.